The German gets 30 points in his last home game. After the same he announced his retirement. Doncic achieved his eighth triple-double (21 + 16 + 11). Everything seemed ready for the farewell. The reception of employees of the franchise upon arrival at the pavilion, its presentation before the game, its exhibition during the same, the attendance of several legends (Pippen, Bird, Nash ...), the festive atmosphere that dominated the environment. 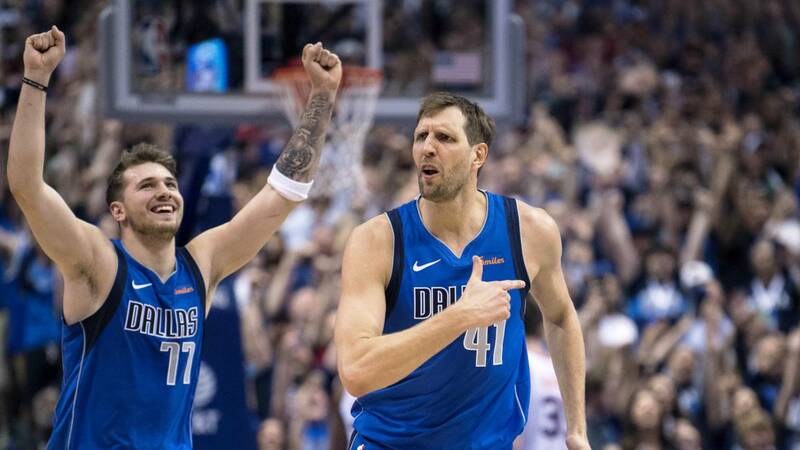 At the end of the match, Nowitzki went to the center of the court, grabbed the microphone and made official what everyone expected: "I want to announce that this has been my last match here" , and the grandstand burst into tremendous applause It seemed to never end. In the absence of a game, was the unofficial end point to a story never seen in the NBA. The first player who has played 21 seasons with the same shirt. And what a player! Y as happens so many times in the withdrawals of the stars, the German dedicated to his fans a match of the old . The desire to please and sign a final match at the height of the circumstances made him throw more shots than ever in the first half. 18 for 19 points, his maximum score at rest since March 11, 2017. At the end he finished with 30, 8 rebounds and 3 assists. And as a cherry, the 5 triples he got will augment him to 11th place in the historic classification of triplists . As if the moment had turned on the other players, several of them wore their best clothes. Luka Doncic, this time in the background, took advantage to sign his eighth triple-double of the season (21 + 16 + 11 + 3) . The other great protagonist was Jamal Crawford, who at 39 years old got 51 points, with 5 rebounds and 5 assists. Nobody so senior had reached 50 points. He was the one who pulled the car of the Suns in a second half (52-71) that led them to fight the game in the last quarter. After dominating the entire game without any problem, the Mavericks were less than five minutes to play and less than five points ahead. We entered the clutch time and, who appeared? Effectively, Doncic with a triple to put land in between. And shortly after Nowitzki to sentence, to everyone's hullabaloo. It's the end of an era in Dallas. When Dirk Nowitzki arrived in 1998, no one could think what that eared German was going to mean for the Texas franchise and for the history of the League and of the sport. The relay has to be taken by a Slovenian boy and the company is as complicated as it is exciting. Because the legacy left by the 41 is of a magnitude at the height of the largest ever. Dallas will always be grateful and those of us who love basketball will be where we are from, too. Tonight in San Antonio we will all provide for the last time the health of Dirk.